Gobin is a small-scale tea grower in Assam, India. He is a heart-felt organic enthusiast. He has devised a way of making his signature tea, Smoked Tea, using equipment traditionally used to pound rice and a wok over a fire. 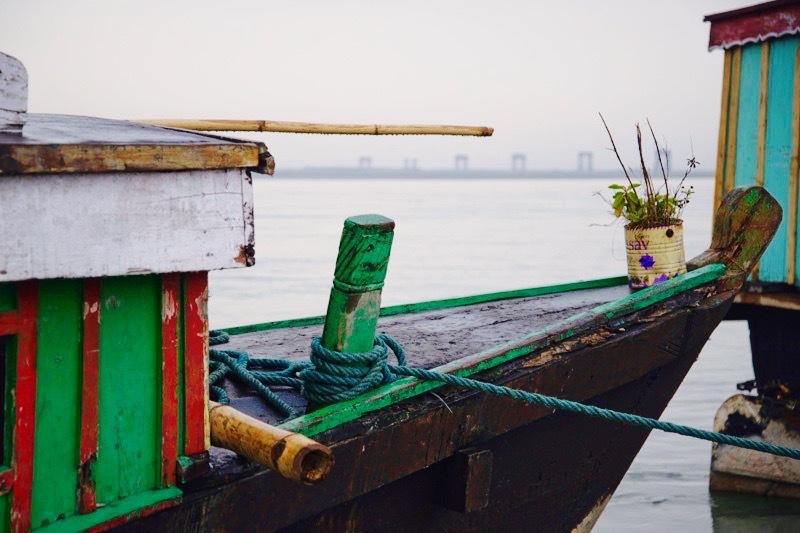 Travel to Gobin's village involves crossing the mighty Brahmaputra river on a long narrow wooden ferry. In honour of his mother and father Gobin has named his backyard garden, the Meen Mohan Tea Garden. It is a beautiful garden backing onto the specular mountains of Bhutan. Despite our challenging language barrier, we always appreciate the enthusiastic discussion with the workers at Gobin's garden and the heartfelt sharing of his poems. The workers at Gobin's garden have allocated their Fair Trade Premiums towards livestock, hand looms and roofing supplies. Laurie (co-owner) and Gobin meet in Assam in 2012. River Ferry on our way to Gobin's home.